Lake Winnipesaukee Cottage in Alton. Cheap ! Bay. 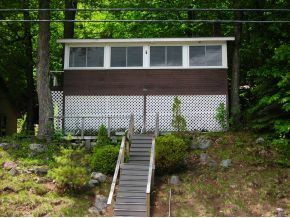 Nice waterfront deck and dock and 60' of deeded frontage on Winnipesaukee. Enjoy all the summer activities just a short walk away and get onto the big lake under $200,000. This Lake Winnipesaukee home is across the street from the lake. This is a small lot with parking on the street for two cars. Just a short walk away and you are at the heart of Alton Bay. Restaurants- Stores,-Entertainment - Fried Food Shacks Listed by Maxfield Real Estate. For additional information on this cottage call Lady of the Lake Realty at 1-888-737-5550 or e-mail at info@nhlakesrealty.com or visit our website to view similar lake homes in New Hampshire at www.nhlakesrealty.com or www.lakeorskirealestate.com Contact us today!